Are you in search of fun bachelorette party ideas that are as unique as they are exciting? We know how hard it can be to find a means of celebrating that is new, classy, and appropriate for such a milstone occasion. That’s why we’ve compiled a list of six fun bachelorette party ideas that will make your celebration unforgettable and help the bride-to-be enjoy her last night as a single lady, while bonding with friends and embracing her femininity. Is the bride a wine aficionado? 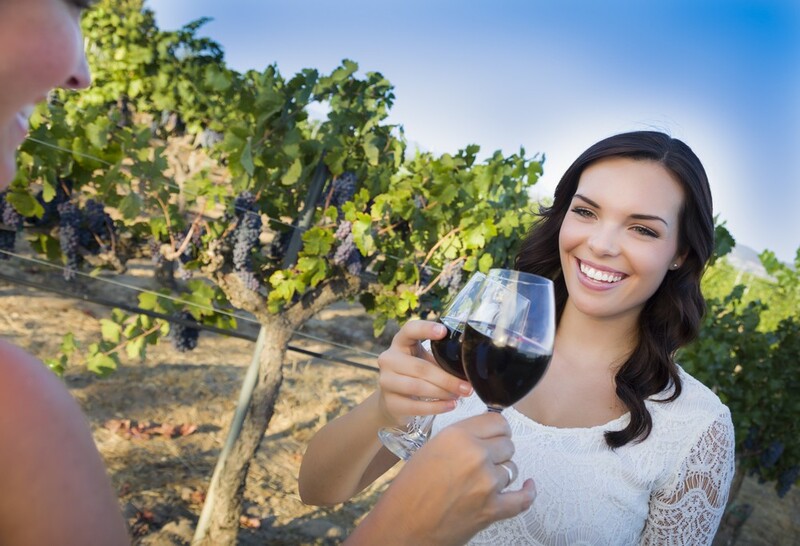 Consider attending a wine tasting or taking a tour of a nearby vineyard. Enjoy the beautiful scenery while discussing wedding ideas and sharing advice with the bride as you make your way through the tour. Women in a vineyard drinking wine. In most cases, where there’s wine there’s fine food. Pick up a few bottles of the bride’s favorite wine and complete your wine tasting adventure at a nearby restaurant, enjoying the wine throughout dinner. What better way to experience new things than traveling to an exotic destination. Almost everyone enjoys exploring new places. Plus, traveling is a great way to bond with and prepare the bride-to-be for her new life ahead. Before choosing a destination, consider how much money you and the rest of the bridal party is willing spend. If you have a lot of cash to spare, traveling abroad might be an option. If money is sparse, consider visiting a nearby city or state. Check out the Pop Surgar’s list of Fun and Frugal Bachelorette Party Destinations for great trip recommendations. Whether you and the girls venture to Hawaii or Las Vegas, create custom destination bachelorette party invites, that include an itinerary, maps, and details, on WeddingPaperie.com. Not for the shy or modest, a boudoir bachelorette party is perfect for brides yearning to try something out-of-the-ordinary, and a little risque, before entering the realm of marriage. When participating in a boudoir session, photos are only part of the experience. Beyond receiving glamorous snapshots, brides will undergo plenty of pampering and primping as well. Soft Pink and Lingerie Bachelorette Party Invitation by WeddingPaperie.com. Most studios provide a colorful collection of attire in addition to hair and makeup artists. Studios also welcome bachelorette parties and BYOB and food is allowed — while others already have refreshments on hand. To make things easier and more comfortable, many boudoir studios are also willing to come to your home or hotel room. 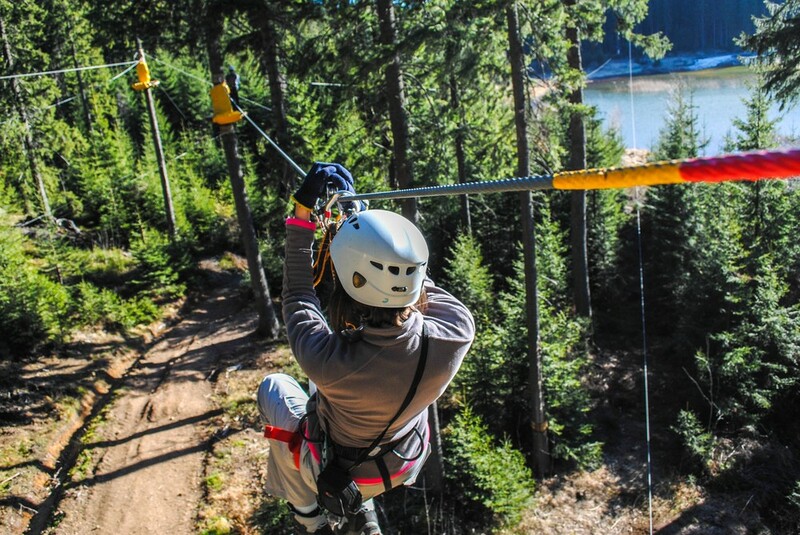 For the sporty, daring, or adventurous bride-to-be, a skydiving or zip-lining session is advised. Such an extreme experience will bring the bridal party closer and leave the bride feeling ready for anything — even the walk down the aisle will seem like a piece of cake. You may even be able to get a deal if your entire bridal party signs up for a class or session. Inquire about groupons and discounts before signing up. Check out these 10 Adventurous Bachelorette Party Ideas for more inspiration. What better way to send the bride off than with tons of cash and prizes! Plan a Hollywood bachelorette party and stop by the Price Is Right to see if there’s space in the audience. Plan ahead by visiting their website and learn how to get free tickets here. Before the show, audience members get interviewed in groups of 15. Based on that interview, producers will pick nine contestants for the show. There are few things you can do to increase your chances of being selected. Start by showing up early. This will give a chance to mingle and show everyone how charismatic and outgoing you are! Secondly, consider wearing coordinating outfits (that are appropriate for TV, yet flashy enough to get you noticed). Finally, flaunt the fact that you are celebrating a bachelorette party — this might be your ticket to fortune and fame. 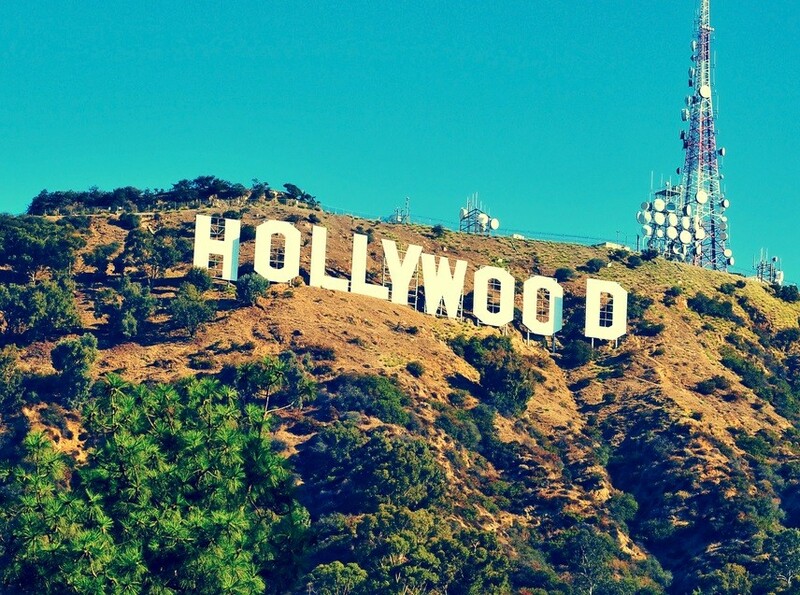 Producers will choose people who appear entertaining, likable, and comfortable on TV. For more tips on how to get picked, check out this article: How My Foolproof Scientific System Got Us Onto The Price Is Right. Does the bride love to dance? Or, maybe she’s petrified of how her first dance will turn out on her big day? Either way, incorporating a dance class into her bachelorette party will be a good idea. 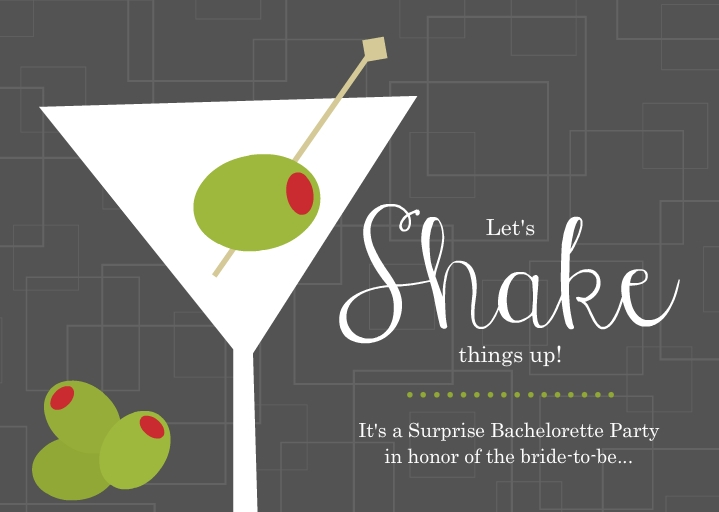 Gray Shaken Martini Bachelorette Party Invitation by WeddingPaperie.com. From ballroom dancing to salsa to swing and line dancing, your options are endless when it comes to selecting a dance class for your bachelorette party. Not only will this idea help the bride feel more comfortable on her feet (for the wedding), but it will teach her and the rest of the bridal party a few new moves they can try out when they hit the town afterwards. Hopefully you’re feeling inspired! Good luck incorporating these fun bachelorette party ideas into your celebration! 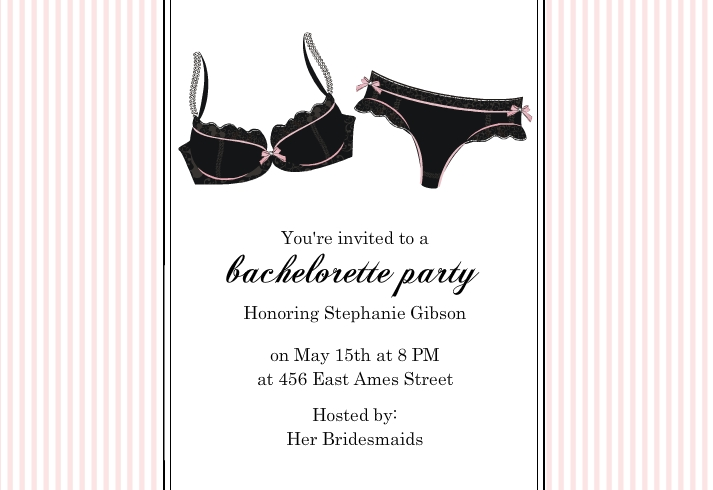 For help designing the perfect bachelorette party invitation, check out our selection of customizable templates at PurpleTrail.com. Please feel free to share with us what you’re planning, or what you did, for your bachelorette party via the comment section below. We always love hearing about new party ideas!